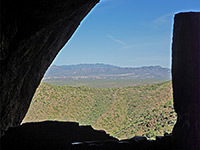 Tonto National Monument contains of the ruins of two cliff dwellings established by the Salado Indians around 1300 AD. The southeast-facing settlements were built quite high up a steep hillside within well-protected natural caves overlooking the Tonto Basin, which is now flooded forming Theodore Roosevelt Lake, though originally the Salt River flowed through the basin which was therefore well irrigated and fertile. As with many other ancient peoples of the Southwest, the Salado appear to have abandoned their villages suddenly, early in the fifteenth century, for reasons which are not known. The national monument, established by President Roosevelt in December 1907, is located 0.8 miles from state route 188 (The Apache Trail) and the shore of Theodore Roosevelt Lake, in a generally rocky and quite empty area that has extensive and varied cacti. The nearest campground is on the far side of AZ 188, nearly opposite - managed by the USFS, this has many sites on flattish land within sight of the lake. Free primitive camping is possible a short distance southeast, along side tracks heading up into the hills. Entrance to the monument (2019) is $10 per person. 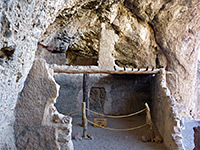 One of the two ancient dwellings (the Lower Ruin) is reached by a paved, half mile, self-guided trail which leads from the visitor center/museum quite steeply 350 feet up the side of a rocky hill, giving increasingly good views of Tonto Basin and Theodore Roosevelt Lake. The trail is closed to uphill travel at 4 pm, giving the last visitors one hour to make the trip, as the monument is closed every day at 5 pm. 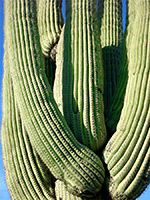 Along the way are notices about the native animals and plants - the area is especially abundant in cacti, the most visible species being saguaro, buckhorn cholla, teddy bear cholla, jumping cholla, Christmas cholla, Engelmann's hedgehog, tulip prickly pear and California barrel cactus. 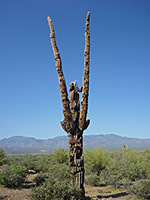 Cacti are also identified along a linked, 0.25 mile trail which provides an alternative route back to the parking area. The two-storey Lower Ruin originally had 19 rooms; most are quite well-preserved and it is permitted to walk through some of them. 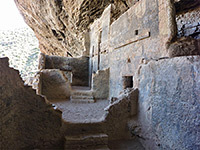 Many surfaces are worn smooth from being walked over or touched yet the walls remain thick and strong, reflecting the generally sturdy if unspectacular construction, not like the more delicate and intricate cliff dwellings of the Anasazi. 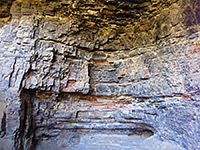 The settlement is constructed in a big alcove lined by unusual metamorphic rocks, greyish overall but including thin-layered components of more brighter colors. Originally, the only access was by ladder, leading to an entrance at the far left of the structure, which made the village easy to defend. A ranger is usually present at the ruin all day, to answer questions and monitor visitor behavior. The second (Upper) ruin is larger, with 40 rooms, but further away and visitors must be accompanied by a ranger; these tours (3 miles round trip) need to be booked in advance. The nearest towns with hotels close to Tonto National Monument are Payson to the north and Globe to the south - follow the links for hotel descriptions and reservations.